A record 3.9 tonnes of ephedrine, plus 350 kilograms of methamphetamine, have been seized and three people arrested as a result of joint investigations between the Australian Border Force (ABF) and the Australian Federal Police (AFP). 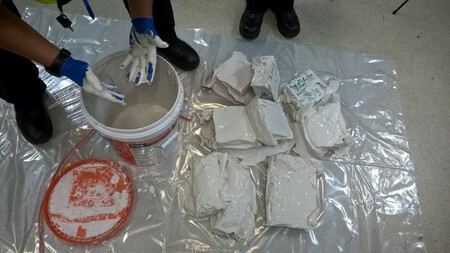 Investigations began with information originating from Thai authorities, about suspected large-scale imports of border controlled drugs into Sydney. In the first investigation, ABF officers conducted targeted examinations of consignments at the Sydney Container Examination Facility and, on Friday, 15 September 2017, detected a sea cargo shipment containing more than 1000 cartons filled with bottles of iced tea. Presumptive testing of the bottles returned a positive reading for ephedrine in approximately one third of the cartons. Each carton contained 24 bottles labelled as iced tea, resulting in a total approximate weight of 3.9 tonnes of liquid ephedrine. This is the largest seizure of precursor chemicals at the Australian border – the previous record was a 1.4 tonne seizure in June 2017. Further forensic examination will be conducted to determine the exact weight and purity of the liquid ephedrine, which will determine the exact street value of the substances*. Following extensive investigations, AFP and ABF officers conducted four simultaneous search warrants in the suburbs of Cabramatta, Rydalmere, Westmead and Revesby on Wednesday, 4 October 2017. A 22-year-old woman – a dual Australian and Chinese national- was arrested in Westmead; while a 22-year-old Australian man was arrested in Rydalmere for their alleged roles in the importation. Both were charged with importation of a border controlled precursor, contrary to section 307.11(1) of the Criminal Code Act 1995 (Cth). The 22-yearold man was also charged with attempting to possess a border controlled precursor, contrary to section 308.2(1) of the Criminal Code Act 1995 (Cth) by virtue of section 11.1(1) of the Criminal Code Act 1995 (Cth). Both appeared before the Sydney Central Local Court yesterday, where bail was refused. These offences carry a maximum penalty of 25 years’ imprisonment. In the second investigation, ABF officers targeted a sea cargo container which arrived into Port Botany on Saturday, 23 September 2017. 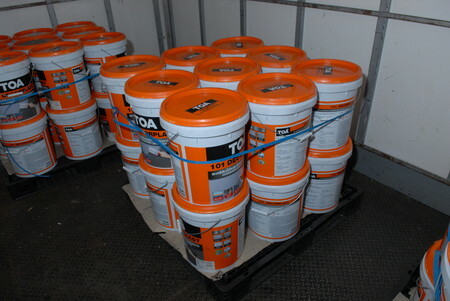 The consignment contained 50 drums of a liquid plaster solution. Seven sealed packets of a white crystalline substance were concealed in each drum, which presumptively tested positive to methamphetamine. The methamphetamine was removed and substituted with an inert substance. On Friday, 29 September 2017, a 31-year-old Glenmore Park man was arrested in Bringelly, NSW, for allegedly accessing the consignment. He was charged with attempting to possess a commercial quantity of a border controlled drug, contrary to section 307.5 by virtue of section 11.1 of the Criminal Code Act 1995 (Cth). The man has been refused bail and is next due to appear before Sydney Central Local Court on Monday, 27 November 2017. The maximum penalty for this offence is life imprisonment. Investigations are continuing in relation to these importations and further arrests have not been ruled out. ABF Acting Commissioner Michael Outram praised the efforts of ABF and AFP officers who worked collaboratively to achieve these unprecedented results. “This result highlights the critical role that intelligence plays between law enforcement agencies and how a collaborative approach can bring down even the most sophisticated syndicates,” Acting Commissioner Outram said. AFP Commissioner Andrew Colvin commended the level of cooperation that turned information from Thailand into arrests in Australia. “We know our country has an insatiable demand for narcotics, and criminal networks will use every concealment method possible to get their harmful substances past our borders,” Commissioner Colvin said. *The ABF and AFP use the ACIC Illicit Drug Data Report (www.acic.gov.au) as the consistent publication for illicit substances in Australia. This figure is the basis of calculating both the monetary value of the illicit drug were it to be sold at the end of the supply chain or ‘on the street’, and the number of related street deals. This is based on available price data and may not be reflective of what would generally be considered as a street deal for this drug type.